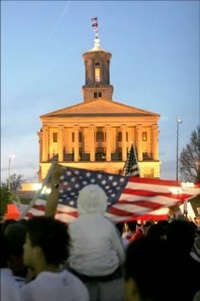 "We are families, we are people of faith, we are contributors to this community"
On Monday, May 21, 2007, at 5pm, hundreds of Tennesseans will gather in the Legislative Plaza in downtown Nashville at a large prayer vigil for comprehensive immigration reform. During the vigil, religious leaders from several denominations and faiths will urge Tennessee decision-makers to show compassion for immigrants, and create an immigration system that is more just and humane and recognizes the many contributions immigrants make to this country. During the vigil, some speakers will speak directly about the recent compromise proposal crafted by U.S. Senate leaders. Those speakers will recognize U.S. Senators of both parties for their recent efforts but will also stress the fact that the proposal needs to be improved. Immigrants and their supporters will share the message that immigrants are family-oriented people, people of faith, and people of the community, and that comprehensive immigration reform must honor these American values. Stephen Fotopulos, Policy Director for the Tennessee Immigrant and Refugee Rights Coalition (TIRRC), will discuss the bipartisan compromise on immigration reform announced on May 17 and how it can be improved. Faith leaders – both immigrant and non-immigrant – are scheduled to speak about issues of faith and belief in an immigration system that acknowledges and rewards hard work and reflects the principles of the American dream. Marches and rallies occurred across the nation last year and were repeated in lower numbers this year, and Nashville was not among the cities that held a rally earlier this month (story here). Thousands of people, dressed mostly in white, marched last year in Nashville from the Titans stadium to Legislative Plaza (story here and photos here).